$1,600,000 Beautifully appointed 4 bed, 3 bath waterfront home with pool and 45' private dock located on protected White Sound. Features include central air, Vinyl PGT windows, Anderson doors, ceramic tiled floors, cypress wood throughout, granite counter tops in the kitchen, breakfast bar, screened in porch, generator, 30,000 gallon cistern and more. Over 65' of waterfront. Strong rental history. 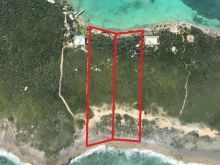 $1,500,000 Located south of the Abaco National Park & next door to the historic Hole in The Wall Lighthouse! The lighthouse played an integral role to seafaring navigators. Just off shore are rich coral reef formations that help create some of the best fishing waters anywhere in the Bahamas. Beautiful elevated Atlantic Ocean vistas surround Hole in the Wall bluff. Facing a southern direction, nestled well off the main highway offering seclusion and privacy. This area is ideal for eco tourism, whale watching, bird enthusiasts and nature lovers. Perfect for developers of eco-friendly resort, university research campus or health & wellness retreat. The closest village, Sandy Point is a rustic village, with great beaches, air strip, local waterfront restaurants. It is also the arrival point of the Bahamas Fast Ferry service. Marsh Harbour the largest town in Abaco is 50 miles north, with international airport offering daily flights from U.S. & Nassau. Featuring major banks, restaurants, retail outlets, medical facilities, and ferry service to the surrounding cays. $550,000 Offering seclusion and privacy overlooking a protected harbour this sea to sea acreage includes dock and cottage! With great elevations offering panoramic views and 275' on the Atlantic Ocean this property totaling almost 4 acres runs consists of two side by side lots. Build your dream home and capture endless views of the sea, own a piece of paradise and have privacy while still being in close proximity of dining, shopping and entertainment. You also have the option to sell one of the lots or develop it so that one property is your private home and perhaps the other a vacation rental home as there are nearby homes that rent very well, especially to avid boaters and their families. Located on the northern end of Tilloo Cay, just minutes south of Tilloo Cut with direct access to world class deep sea fishing with a protected 50' dock on the lee side. World famous Tahiti Beach and dining on Lubbers Quarters are minutes away. Shopping and entertainment in Hope Town are only a 10 minute boat ride away. There is also small 1 bed, 2 bath island cottage with deck located on the southern lot. $120,000 Best Priced lot in Hope Town. Don't miss this fantastic opportunity to build your dream home on this half-acre wooded lot situated in the quiet and peaceful neighborhood of Lucayos. This community offers owners the use of a community day dock. This property is centrally located close to shopping and dining. $110,000 This elevated lot in the quiet residential community of Big Point features distant ocean views and lush native vegetation with thatch palm trees, Gumelemi & mature coppice. The site is 9,410 square feet is located on the Atlantic side sure to guarantee lovely ocean breezes. Situated just off Big Hill & Centre Line Road about 2 miles south of Hope Town. All utilities are underground and the roads are paved making this a convenient location for building your dream home. Close to Firefly Sunset Resort, Abaco Inn, Sea Spray Resort & Marina, The Foodstore Limited and White Sound Wines & Spirits. Beach access in White Sound is just minutes away.